Did your dentist prescribe a root canal procedure to treat a damaged or diseased tooth for you and you are worried? Well, don’t be. This is because there are millions of teeth that are saved this way each year, relieving a tremendous amount of pain and making teeth healthy again. You need a root canal when there is inflammation or infection in the roots of your tooth and the procedure can usually be completed in one or two appointments, depending on the condition of your tooth. Getting a root canal is generally painless and highly effective. You’ll have returned to smiling, biting and chewing effortlessly in a matter of seconds. To start the procedure, a series of X-rays is taken on the affected tooth to build up a clear picture of the root canal and assess the extent of the damage. Root canal treatment is usually carried out under local anaesthetic, however, in some cases where the tooth is no longer sensitive, it may not be necessary. 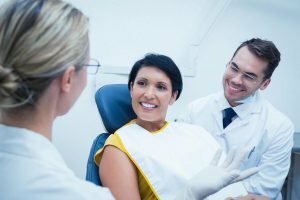 Though your dentist may use special local anaesthetic techniques in situations where teeth may be difficult to anaesthetise to ensure your treatment is not painful. Your dentist will put a rubber sheet around the tooth to guarantee it is dry amidst treatment. The rubber sheet likewise averts you gulping or breathing in any chemicals the dentist uses. After the pulp has been expelled, your dentist will clean and enlarge the root canal so it very well may be effectively filled. The root canal is generally tight, which makes it hard to fill. Your dentist will utilise a series of small files to broaden the canals and make them an ordinary shape so they can be filled. In the event that the treatment will be completed more than a few sessions, your dentist may put a little measure of medication in the cleaned canal in the middle of visits to kill any outstanding microscopic organisms. The tooth will then be sealed utilising a temporary filling. At your following visit, the temporary filling and medication inside the tooth are expelled and the root canal filling will be embedded. This, alongside a filling, seals the tooth and prevents reinfection. Root-filled teeth are bound to break than healthy unrestored teeth, so your dentist may recommend setting a crown on the tooth to ensure it doesn’t break. When it comes to root canal treatment, count on DonEast Supreme Dental. Our dentist and staffs are dedicated to providing top-notch high-quality dental services to patients across communities in Nunawading, Balwyn North, Box Hill, Blackburn North, Box Hill North, Templestowe.